This nontoxic glue stick features an easy-to-use solid stick formulation. Applicator twists up for use and retracts for storage. Rub onto paper, fabric, photos, and cardboard. Reusable adhesive replaces glue, tacks and pins to hang just about any light item such as posters, photos, and notes. Leaves no stains, no holes, no marks. Adhesive is long-lasting and doesn't dry out. Has hundreds of uses around the office, home or classroom. 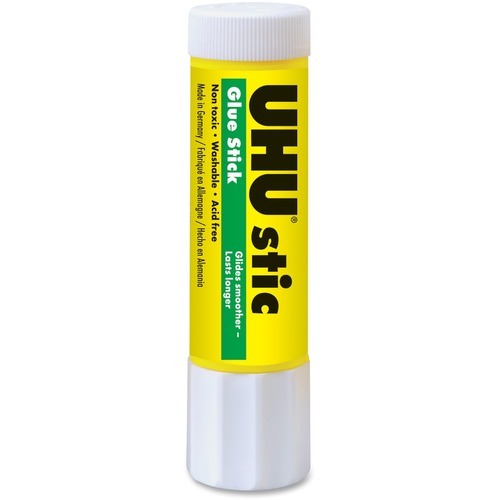 UHU Rub-on adhesive works without wrinkling paper, cardboard, photos or fabric. Lipstick-type applicator twists up for use and retracts for no-mess storage. Washable adhesive is acid-free, odor-free and photo-safe. • ACMI certified glue conforms to ASTM D-4236. Scotch Clear Repositionable Glue Stick neatly transforms paper, cardboard and photos into self-sticking, removable, and repositionable items. Adhesive removes without damaging surface. Easy-to-use glue stick solid is photo-safe and nontoxic. Hands and household surfaces clean easily with soap and water. Rub-on adhesive in glue stick works without wrinkling paper, cardboard, photos or fabric. Lipstick-type applicator twists up for use and retracts for no-mess storage. Washable adhesive is acid-free, odor-free and photo-safe. ACMI certified glue conforms to ASTM D-4236.